UPDATE: The House passed the Small Business Tax Cut Act on Thursday April 19, largely along party lines. However, the Obama Administration has already said that it will very likely veto the bill. Riding the momentum of last week's passage of the JOBS Act, the House of Representatives is set to vote on a bill next week that, if passed, would cut taxes for businesses with fewer than 500 employees by 20 percent for one year. But you’d best not start planning your cash flow projections for 2013 with this tax cut in mind. The bill, called the Small Business Tax Cut Act, was introduced last month. If it were to become law, it would provide a one-year tax deduction equal to 20 percent of active business income. The tax break would be available to all companies with 499 or fewer employees, whether they are organized as a corporation, sole proprietorship or partnership. The tax break would max out at 50 percent of a business's wages paid, as reported on W-2 forms. The precedent for the bill is grim: A version of it was proposed last year and never enacted. It excluded certain types of companies from benefiting from the tax cut, like financial- service companies, law firms, and hedge funds, points out Joseph Rosenberg, a research associate at the Urban-Brookings Tax Policy Center in Washington, D.C. This bill makes no such exclusions. Not surprisingly, the bill has the support of scores of business groups ranging from the American Dental Association to the Interlocking Concrete Pavement Institute and World Golf Foundation. It comes as the U.S. has achieved the dubious honor of having the highest corporate tax rate in the world. Calls for tax reform are ubiquitous. The bill's critics say, if passed, it would disproportionately assist the wealthy. An analysis by the Tax Policy Center, a nonpartisan, independent research center run by the Urban Institute and the Brookings Institution, found that 49 percent of the benefit of the tax change would go to those with incomes above $1 million. Those with incomes of less than $75,000 would see only 3.5 percent of the tax benefit. 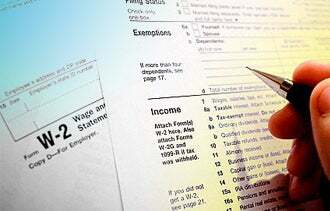 For those with more than $1 million in income, the tax change would amount to an average of $44,635, the Center found. The proposal would cost $45.9 billion, according to an estimate from the Joint Committee on Taxation, a nonpartisan committee of the Congress that advises on tax legislation. If the House passes the bill, it then would have to go to the Senate for a vote. Senators have their own bill to give a tax credit to small businesses. Stay tuned for updates.